All cardstock are Pure Luxury Heavy Based by GinaK Designs. The image is from the 'True Love' stamp set and the sentiment from the 'Whimsical Wishes' stamp set, both also from GinaK Designs. I stamped both the image and sentiments with Memento Tuxedo Black ink and used my Tim Holtz distressing tool on the pink and black cardstock. I sponged Tim Holtz Spun Sugar distress ink around the edges of the white card base. The ribbon and pearlies are from my stash. 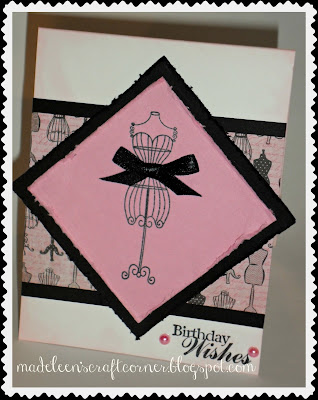 I'm also entering this card into this week's Mix it up Monday challenge over on StampTV. This is gorgeous, Madeleen. The DP goes beautifully with the image.